Mctaggart-cowan, Ian. "Seal". The Canadian Encyclopedia, 22 March 2015, Historica Canada. https://www.thecanadianencyclopedia.ca/en/article/seal. Accessed 18 April 2019. Seal is a common name given to a diverse group of aquatic, generally marine mammals of the order Pinnipedia. Ringed seals live exclusively in the Arctic (Corel Professional Photos). Grey seals breed and molt in dense colonies (artwork by Pieter Folkens). 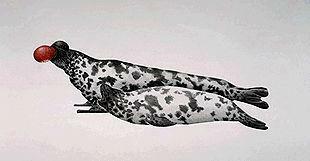 The harbour seal is the most widespread seal (artwork by Pieter Folkens). 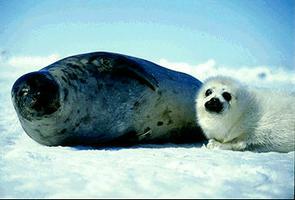 The harp seal was the basis for the sealing industry in Canada. In some years 300 000 were killed, but the hunt has declined drastically because of worldwide protests (artwork by Pieter Folkens). Seal is a common name given to a diverse group of aquatic, generally marine mammals of the order Pinnipedia. 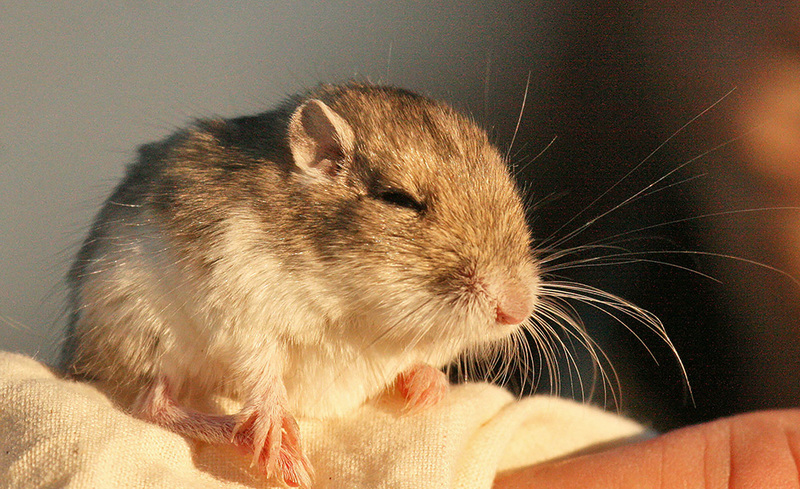 There are two distinctive groups: eared and earless. All have streamlined bodies, limbs developed into flippers, eyes adapted for vision both in and out of the water and valved nostrils. The respiratory, circulatory and excretory systems of seals are adapted to life without fresh water and to holding their breath while diving. Eared seals in Canadian seas are the northern fur seal (Callorhinus ursinus), the northern (or Steller’s) sea lion (Eumetopias jubatus) and the California sea lion (Zalophus californianus). The northern fur seal is the smallest species, unique for its dense coat of fur that keeps the skin dry and protects the animal from cold water. The northern sea lion is the largest species, with males growing up to 3 m long and weighing 900 kg. Sea lions lack an underfur and have blubber for cold protection. The bodies of eared seals are streamlined for high-speed swimming, which is done with oar-like action of large, hairless fore flippers, using hind flippers for manoeuvring. On land, they walk or lope using both fore and hind flippers. They have a small external ear (pinna). 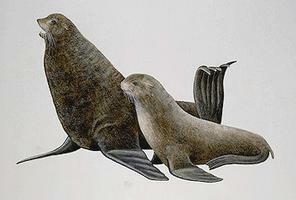 Adult males are much larger than females (in northern fur seals, males can reach 320 kg, females only 60 kg). Eared seals in Canadian waters are confined to the Pacific Ocean. The northern fur seal breeds on Pribilof and Bogoslof islands off Alaska, San Miguel Island off California and Robben Island, the Kuril Islands and the Commander Islands off Russia.In winter, it is found along the British Columbian coast. The northern sea lion inhabits waters from central California north along the west coast of North America to the Gulf of Alaska, through the Bering Sea then south along the east coast of Asia to the northern coasts of Japan. 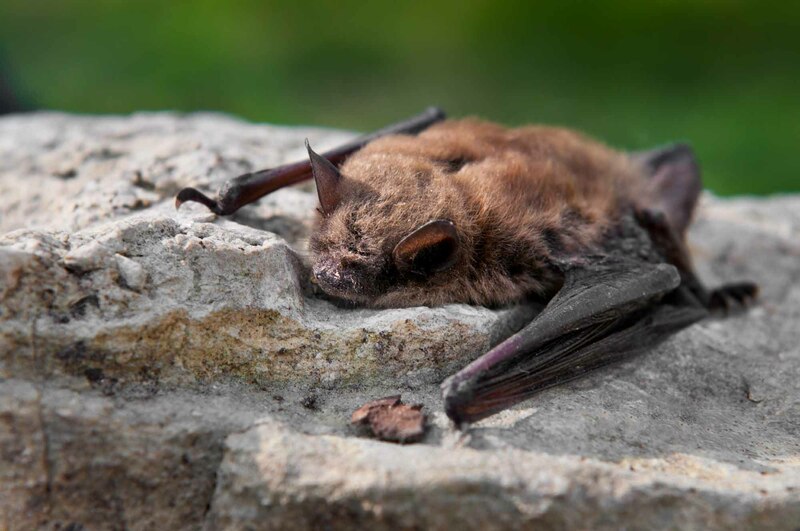 Two large breeding colonies are in British Columbia. The California sea lion invaded Canadian waters (the coast of Vancouver Island) as a winter visitor in about 1970, but today only males make this migration. All three species are fish eaters (herring, pollock, salmon, octopus, etc. ), and sometimes consume seabirds. Sea lions have a harem organization, with the strongest adult males controlling the breeding access from one to as many as 60 females. One pup is born annually after a gestation period of 11–12 months. The pups do not swim when young and have a long nursing period: four months (northern fur seal) to more than a year (sea lion). Though both sexes are capable of breeding at ages between three and five years, males are unable to secure a mate until seven or more years old. The pelts of the northern fur seal have been much sought after by the fur trade. Canadian sealers participated in the hunting of this seal between the 1890s and 1911, reducing the population from some 4.5–5 million to about 300,000. In 1911, the North Pacific Fur Seal Treaty between the United States, Great Britain (for Canada), Japan and Russia provided conservation and the population gradually increased to about original numbers. An overkill of females from the mid-1950s to late 1960s as well as the development of the pollock fishery again reduced numbers (seals become tangled in fishing gear). Since 1984, the northern fur seal has been protected under US law. 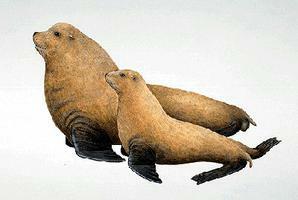 The northern sea lion was hunted by Aboriginal people for its hide, meat and oil. There was a small commercial harvest between 1913 and 1940, but declines in seal numbers resulted largely from killings on rookeries from 1936 to 1967 to protect fisheries. The northern fur seal is listed as threatened by the Committee on the Status of Endangered Wildlife in Canada (COSEWIC), and as vulnerable by the International Union for the Conservation of Nature (IUCN). 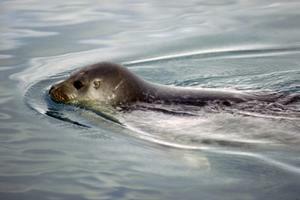 By comparison, the northern sea lion is in COSEWIC’s “special concern” category and IUCN’s “near threatened” category. Both organizations consider the California sea lion not at risk. The ears of earless seals are openings on the side of the head with no pinna (external ear). 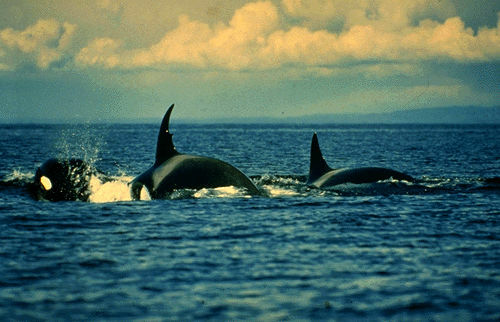 They swim using side-to-side movements of the hind flippers that are permanently rotated backwards; fore flippers are short with terminal claws; and all flippers are haired. On land, they drag themselves with the fore flippers or undulate caterpillar-like. Males, except in grey and elephant seals, are only slightly larger than females. Earless seals are excellent breath-hold divers. Ringed seals may stay submerged for 45 minutes and elephant seals for as long as two hours; most other species dive for shorter periods. Elephant seals feed along the edge of the continental shelf where they regularly dive to depths of 800 m.
Six species of earless seals regularly inhabit Canadian waters: harbour (Phoca vitulina), ringed (P. hispida), harp (P. groenlandica), bearded (Erignathus barbatus), hooded (Cystophora cristata) and grey (Halichoerus grypus). The northern elephant seal (Mirounga angustirostris) is an infrequent visitor. They are found in the waters of all three Canadian oceans: harbour in both Pacific and Atlantic; bearded and ringed in the Arctic; harp and hooded in the North Atlantic and parts of the Arctic; and grey in the Atlantic from Labrador south to New England. The northern elephant seal migrates north from its breeding grounds in Mexico and California to occur infrequently along the British Columbian coast. Harp seals have an annual migration of some 3,200 km from the Arctic Ocean in the summer months to Newfoundland and the Gulf of St. Lawrence in the late winter and spring. Hooded seals also make long migrations. Ringed and bearded seals may move long distances between summer and winter in order to stay with ice; grey and harbour seals are more sedentary. Diet consists of fish, squid, shrimp and crab and varies with the species and the locality. Ringed seals eat polar cod, shrimp and large plankton; Atlantic species eat polar and Atlantic cod, capelin, flatfish and sculpins; while harbour seals eat a varied diet including bottom fish, cod, rockfish, herring, salmon, crabs and octopus. In most species, age at first breeding in females is three to six years and males the same or slightly older. Except for elephant and grey seals, animals are dispersed during the breeding season and a male may breed with only one to a few females; while elephant seals have harem breeding. A single pup is born annually after a gestation period of 11–12 months, including a period of delayed implantation. The season of birth is variable: ringed, bearded and hooded seals give birth on the ice in March and April; harp, mid-February to mid-March; grey, mid-January; and harbour, during the summer. Young are relatively large at birth (a 180 kg hooded seal may give birth to a 27 kg pup) and can swim well soon after (except the elephant seal). The period of nursing is short, from three to five days among hooded seals to about a month for harbour seals. After weaning, the pup is independent. The harbour seal in British Columbia and the several species of the Atlantic are believed to be competitors with humans for commercially valuable fish species, but there is little evidence that decreasing the seal population increases the available fish catch. Harbour seals may cause serious losses to local salmon runs by concentrated feeding on migrating salmon in river mouths; to salmon aquaculture; or by taking salmon directly from gill nets. The grey seal is also a host of a parasitic worm that caused commercially important losses to the Atlantic cod industry. Ringed and bearded seals are a major resource to the Inuit as food, saleable pelts and, formerly, many other useful products. Harp and hooded seals have been a source of food and saleable hides for coastal people of the Atlantic provinces. Most of the six species of earless seals (harbour, ringed, hooded and grey) are considered not at risk by the Committee on the Status of Endangered Wildlife in Canada (COSEWIC), with the exception of a rare freshwater subspecies of harbour seal called P. vitulina mellonae, which was listed as endangered in 2007. The remaining two species ¾ harp and bearded seals ¾ do not have a COSEWIC status; however, the International Union for the Conservation of Nature views neither species as vulnerable. The IUNC also lists the hooded seal as vulnerable, but like COSEWIC considers the harbour, ringed and grey seals as not at risk. There is much high-profile, public opposition to the harvesting of seals, particularly harp and hooded seal pups (known as whitecoats and bluebacks respectively, based on the colour of their pelts). Protests focus on these species in part because harp seals account for the vast majority of the commercial seal harvest in Canada, and the pelts of young seals hold more market value. Despite this opposition, seal hunts are carefully managed in Canada, and the harvesting of seal pups has been illegal since 1987. 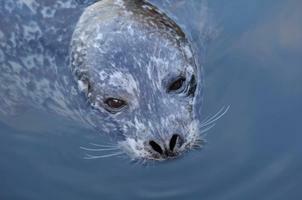 Of increasing concern is the threat of climate change on earless seal species. Since sea ice constitutes an important part of their habitat ¾ often for breeding purposes ¾ its reduction may harm populations in the future. Hooded SealAn interesting website about the hooded seal, Cystophora cristata. From the International Marine Mammal Association.